Kanan Jarrus (born Caleb Dume) is a character in the Star Wars franchise, a main character in the animated series Star Wars Rebels. Introduced as the Padawan apprentice of Depa Billaba, he is the leader of the crew of the Ghost and the Jedi Master of Ezra Bridger. Kanan is also featured in other media such as books and video games. Kanan is voiced by actor Freddie Prinze Jr. in Star Wars Rebels, and by Michael Benyaer in the micro-series Lego Star Wars: Droid Tales. 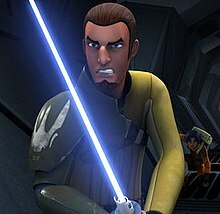 Kanan Jarrus (voiced by Freddie Prinze Jr.) first appeared in a short film, "The Machine in the Ghost", and then in "Spark of Rebellion", the two-part pilot episode of Star Wars Rebels. Kanan leads the crew of the Ghost, a rebel starship. Although he never finished his own Jedi training, Kanan sees great potential in young Ezra Bridger of Lothal. He decides to train Ezra as his own Padawan. In "The Siege of Lothal", the two-part premiere of season 2, Kanan survives an encounter with Darth Vader, while in "The Lost Commanders", Kanan initially finds it difficult to trust the clone trooper Captain Rex, because clones had murdered his master, Depa Bilaba, as well as most other Jedi, in obedience to Order 66. In "Shroud of Darkness", a later episode in Season 2, Kanan is promoted to the rank of Jedi Knight during a series of adventures in a Jedi Temple on Lothal. In "Twilight of the Apprentice", the two-part finale of season 2, Kanan travels with Ezra, Ahsoka Tano, and the astromech Chopper to the Sith planet Malachor in hopes of finding the knowledge they need to defeat the Sith. There Kanan is blinded in a lightsaber attack by Maul, who has been posing as a frail hermit. In season 3, a Force-sensitive creature called the Bendu mentors Kanan in the ways of Force-sight. Kanan still participates in Rebel missions, with his mastery of the Force compensating for his blindness, but he takes a less active role in leadership. Later, in the two-part episode "Ghosts of Geonosis", Kanan meets the resistance fighter Saw Gerrera. In "Trials of the Darksaber", Kanan trains Sabine in lightsaber combat (albeit Sabine does not have "Force" sensitive abilities). Season 4 confirmed Kanan and Hera as a romantic couple. At some point during in season 4, he and Hera conceive a child together, a son she names Jacen. Kanan dies in the episode "Jedi Night" while rescuing Hera from Imperial captivity. He regains his eyesight moments before being consumed in an explosion, after containing the blast long enough for Hera and the rest of their group to escape harm. Filoni felt this was a natural end to Kanan promising he will see Hera again before being blinded and said: "In that moment he's not bound as this material thing that the physicality of sight would be a limitation to him." While sketching storyboards for Kanan's death, Filoni became reluctant to kill the character, but Prinze, who "was resolute about the fact that his character needed to die" since the beginning of the series, encouraged him to write the scene. In September 2, 2014, Del Rey Books published Star Wars: A New Dawn, a prequel novel telling the story of how Kanan and Hera met. The comic-book Kanan ran for 12 issues and was published by Marvel Comics, the series is set during the events of the first season of Star Wars Rebels and focuses on Kanan Jarrus having flashbacks to his time as a Jedi Padawan (when he was known by his real name Caleb Dume). Two story arcs were produced each ran for six issues, the first arc The Last Padawan focused on flashbacks which happened at the same time as Star Wars Episode III: Revenge of the Sith showing where Kanan was when Order 66 happened and the clone troopers betrayed and killed most of the Jedi, including his Jedi Master Depa Billaba. While the second arc First Blood flashbacks focused on how Kanan was assigned under Depa Billaba's mentorship, as well as Kanan's first battle along clone-troopers, in the Clone Wars, where he made a friendship with a clone trooper, it features an appearance from Rae Sloane a character from the novel Star Wars: A New Dawn, as well as one from Fenn Rau a mandalorian character who would later appear in Star Wars Rebels. Jarrus appears in the third episode of Lego Star Wars: Droid Tales. The following games depict Jarrus as he appeared when the series first began. Jarrus is a premium character in the now-defunct game Star Wars Rebels: Recon Missions, released by Disney Mobile on iOS, Android and Windows Store, a side-scrolling, run-and-gun platform game. He has the ability to deflect blaster bolts from a stationary position. Jarrus is represented as Chuck, the yellow bird in Angry Birds Star Wars II, in its Rebels level set. Jarrus is a collectible add-on character for the toys-to-life video game Disney Infinity 3.0. Jarrus is one of the several bonus characters available as downloadable content for Lego Star Wars: The Force Awakens, as part of the Star Wars Rebels character pack. The following games depict Jarrus as he appeared at the start of the third season, in which he is coping with the loss of his sight. Jarrus appears in the mobile MOBA Star Wars: Force Arena as a summonable unique assistant for any Light Side squad led by Ezra Bridger, and was available on the game's initial launch in early 2017. Jarrus is a collectible, playable character added to the mobile turn-based role-playing game Star Wars: Galaxy of Heroes in a special Rebels-themed update during the game's second year of operation. He is classified as a tank that disrupts enemy offense, taunts and grants protection to allies. ^ Hibberd, James (February 11, 2014). "'Star Wars Rebels' first human character revealed". Entertainment Weekly. Retrieved February 11, 2014. ^ Keane, Sean (2016-03-30). "Star Wars Rebels S2 finale: Twilight of the Apprentice". New York Daily News. Retrieved 2016-12-19. ^ "See Ya Next Year! on Twitter: "Is Kanan now a reference to Rahm Kota? No, but they both owe a debt to Zatoichi, a character every SW fan should know about. #StarWarsRebels"". Twitter. 2016-03-30. Retrieved 2016-12-19. ^ "Star Wars Rebels: 'The Siege of Lothal'". The A.V. Club. 20 June 2015. ^ "Star Wars Rebels: 'The Lost Commanders' Review". IGN. 2015-10-14. Retrieved 2016-12-19. ^ Goldman, Eric (30 March 2016). "Star Wars Rebels: 'Twilight of the Apprentice' Review". ^ Goldman, Eric (7 January 2017). "Star Wars Rebels: 'Ghosts of Geonosis' Review". ^ Johnson, Kevin. "Sabine's darksaber training opens up old familial wounds in an emotionally rich Star Wars Rebels". ^ "Star Wars Rebels Has Heartbreak On The Horizon". 7 November 2017. ^ Ratcliffe, Amy (February 19, 2018). "Dave Filoni on That STAR WARS REBELS Death". The Nerdist. Retrieved February 19, 2018. ^ Goldman, Eric (August 30, 2014). "Star Wars: A New Dawn Review". IGN. Retrieved May 27, 2016. ^ "Disney and Random House announce relaunch of Star Wars Adult Fiction line". StarWars.com. April 25, 2014. Retrieved April 25, 2014. ^ "SWCA: Star Wars Comes Home to Marvel Panel Liveblog". StarWars.com. Retrieved February 5, 2017. ^ "Star Wars Rebels not only provides a great episode, but also finally gives Sabine her due". The A.V. Club. 28 January 2016. ^ O'Neil, Shana. "Ranking Rebels: 5 Highlights from "Jedi Night"". www.starwars.com. This page was last edited on 20 March 2019, at 15:01 (UTC).